Science fiction on the epic scale of DUNE, yet as grounded in the Christian world view as CS Lewis' Space Trilogy. Experience fast-paced adventure, exotic settings and cliff-hanging suspense as Dr Spencer Reston discovers he is the vital link in a cosmic plot which has civilisation hanging in the balance. From Lion. A sleep scientist on a space station becomes a vital link in a cosmic coup masterminded by a mysterious creature known as the Dream Thief, in this gripping science fiction adventure by the author of the Dragon King Saga and the Song of Albion Trilogy. Sleep scientist Dr. Spence Reston is having trouble sleeping. His experiments are giving him dreams that haunt his waking hours, and he has long periods for which he has no memory. Is he losing his mind? Or is there another altogether more frightening explanation? Thus begins a battle for the future of the universe, in which the fate of humankind hangs on the fragile sanity of one man. Original and accomplished, bursting with suspense and intrigue, "Dream Thief" is science fiction on a grand scale. 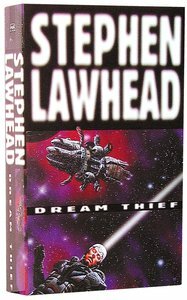 Customer Reviews For "Dream Thief"
This is a science fiction story that explores a different world, a different culture, and is easy to relate to in the sense that one can almost believe it could be true! I love the Christian message and theme that comes through, especially as it is portrayed from a scientist's perspective. Definitely recommending this one!